Fancy magpies on your scarf, roses on your sari or a Hedwig to be perched upon your shirt sleeve? Tanuja, an artist from Bhubhaneswar will paint that for you and send it over to you. We stumbled upon Tanuja’s page on an bi-daily insta check up, and have fallen in love. Using paints, she makes simple and ordinary objects beautiful with the touch of her paintbrush. 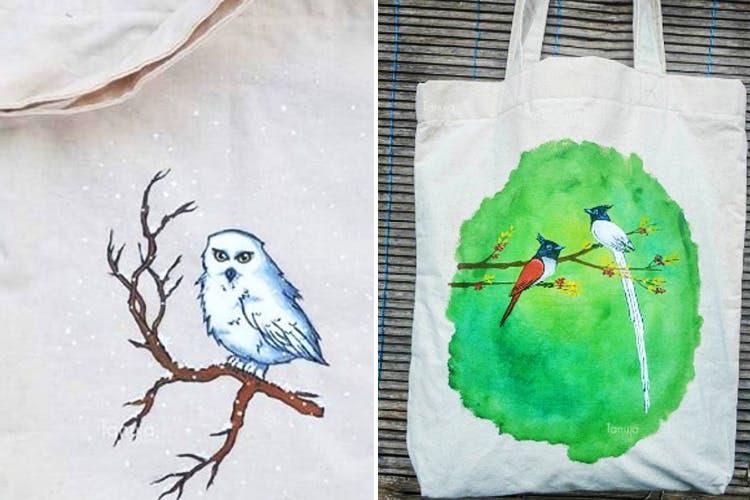 From tote bags in different sizes, scarves and dresses and even beautiful sarees which have been handpainted. Apart from picking up what is already available on her shop, you can get your favourite book characters customised and painted on a product. A bag starts at INR 450, a scarf is for INR 800 and a sari is for INR 4000. Take a look at her prints and designs here. They’re beautiful, pretty and truly one of a kind.